St. Francis Xavier Catholic Church in Chinese Camp, Cal. It was inevitable, thousands upon thousands of gold-seekers came to California to search for riches. They staked claims, fought bandits and the elements, built crude cabins, mining camps and towns. Businesses, schools, stores of every kind, restaurants, jails, gold mines and churches. They lived and they died. Many of those camps and towns are completely gone now, without a trace, but a good many remain. And those that do remain all have one thing in common, and that's their cemeteries, the final resting place for those pioneers who stayed in the camps and towns they helped to build. 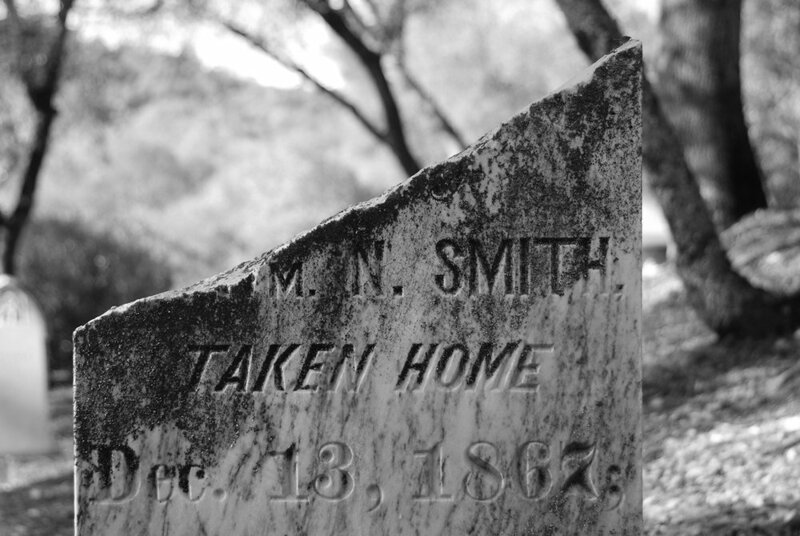 City cemeteries, Church cemeteries, Fraternal Organization cemeteries and even boot hills. Walking through the pioneer cemeteries, reading the names and dates inscribed on the stones, can't help but bring to mind thoughts of the stories that lay buried beneath the soil. Because each one had their own life tale and the life of most of the early day settlers in the Gold Country wasn't an easy one. Accidents, illness, bad weather, bandits; there were so many ways to end up six feet under. 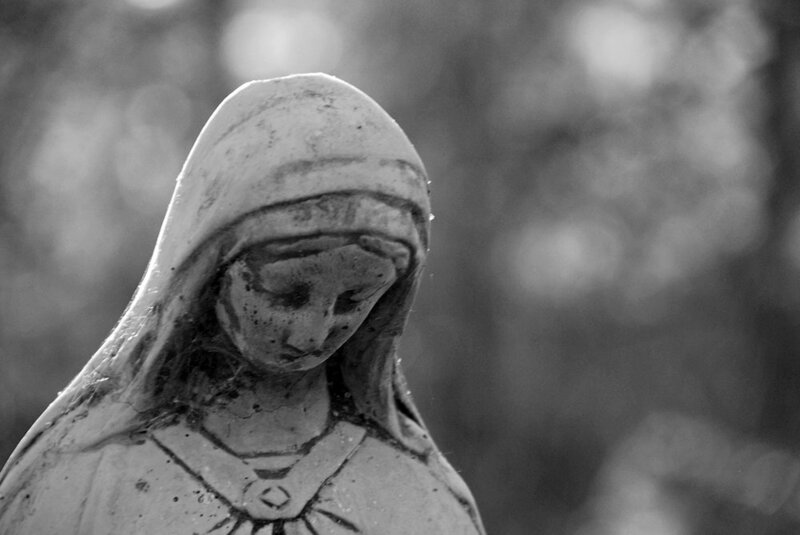 I admit to having a fascination with these old boneyards; the small statues, the large monuments, the crosses, the tombstones with their etched epitaphs. I can easily spend an hour or two wandering through them, reading the names (some nearly faded away, others as clear as the day they were chiseled) and the dates of birth and death. There's a certain melancholy peacefulness in these sacred places that I feel in touch with, but not mobidly so. Following are a few of the cemeteries I've visited over the years, which are only a small sampling of the ghosts of the gold rush. Altaville's Protestant Cemetery dates back to the early days of the Gold Rush. It's quite large and is located adjacent to the town's Catholic Cemetery, a short distance southwest of Hwy 49 on Stockton Road. St. Annes’ Catholic Church in Columbia, Cal., stands atop Kennebec Hill at the end of Church Street, overlooking some of the world’s richest placer grounds. Completed in 1856, the church was funded by miners’ donations, even the land upon which it stands was donated as three miners gave up their unworked claims. One of the first brick churches in California, St. Anne’s was built from bricks fired in the kilns located on Springfield Road. The timbers used in its construction came from nearby Saw Mill Flat, hewn from local trees. Father Daniel Slattery was the man responsible for getting the church built. He circulated the petitions and collected the donations. He also served as the first priest. The belfry was added in 1857, with the silver alloy bell being installed that spring. It was cast at Troy, New York, and was shipped around the Horn, costing the miners another $1,500 in donations. Its mellow tone could be heard throughout the mines, calling the faithful to meeting. The beautiful murals located behind the altar were painted by James G. Fallon, proprietor of the Fallon Hotel. The hallowed ground upon which the church rests was believed to be the only unmined ground in the area. When miners later filled a cut on the north side of the church; however, they found evidence of some clandestine mining. Someone had tunneled under the church, and working at night, had carried away the paydirt to another location for washing. During the day the night miners would cover the tunnel opening with rocks and brush to avoid detection. They were never discovered. The pine tree clad grounds around St. Anne's provide a beautiful resting place for many of the early day citizens of Columbia. The Columbia City Cemetery is located up behind the stately two-storied brick Schoolhouse that sits on a small hill, at the top of School Street. I often wondered if the school teachers ever used the nearby cemetery as a lesson for unruly students, "You're going to end up behind us if you don't behave, young man!" 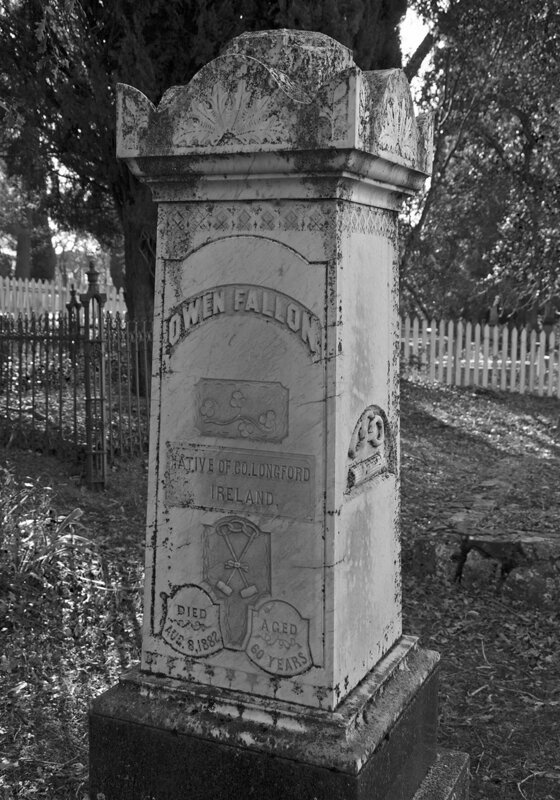 Owen Fallon, a stone cutter from Ireland, arrived in Columbia with his family in 1856. Choosing the life of an innkeeper over that of the miner, Fallon purchased a miners’ boarding place known as the Main House in April of 1857. Constructed sometime after the fire of 1854, which destroyed the previous wooden stores on the site, the Main House survived until it was claimed by the fire of 1857. Fallon rebuilt, his second building lasting until 1859, when it too went up in flames. Learning his lesson, Fallon built his third structure of brick. It was completed in 1860 and opened as the Fallon House. His two neighbors to the east also built of brick after the fire in 1859, and in 1863 he purchased the building next door from a Mr. Cardinell and joined the two buildings by opening a hallway. Fallon later acquired the Gunn Saloon which was the next building to the east. These three buildings became Fallon’s Hotel. Therefore prepare to follow me! 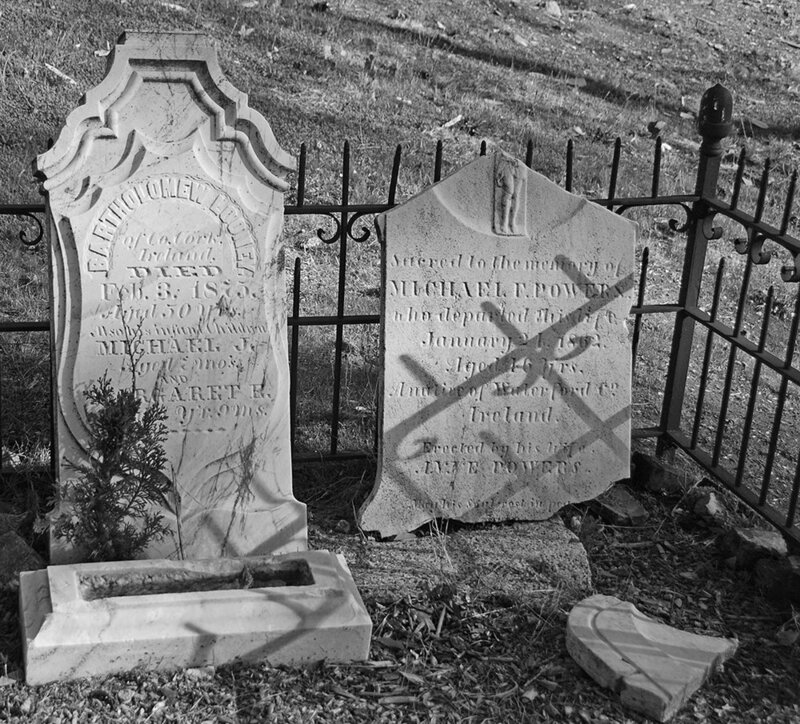 These two headstones are located in the Copperopolis Cemetery, which is actually four cemeteries in one; Masonic, I.O.O.F., Presbyterian and Catholic. The cemeteries are separated by low stone walls, in which gates allow access from one to another. The graves date back to the early 1860s, and many of the town's pioneers are buried here, including William Reed, the man who discovered copper in Copperopolis. Another notable grave belongs to William Shepley, whose epitaph has gained some measure of renown in this graveyard of old bones where squirrels keep the dead company. His stone was carved in Shaws Flat, most likely of Columbia marble. The Public Cemetery, with its intricate rockwork and aging gravestones, rests in peace under shady trees on a small hill on Cemetery Street. George and Margaret Coulter are buried here and a walk through the cemetery will reveal many other names of the early pioneers who helped found and build Coulterville. George Stevens, Aged 12 Yrs, 5 Mo's & 9 D'ys. Wrought iron detail of grave enclosure. 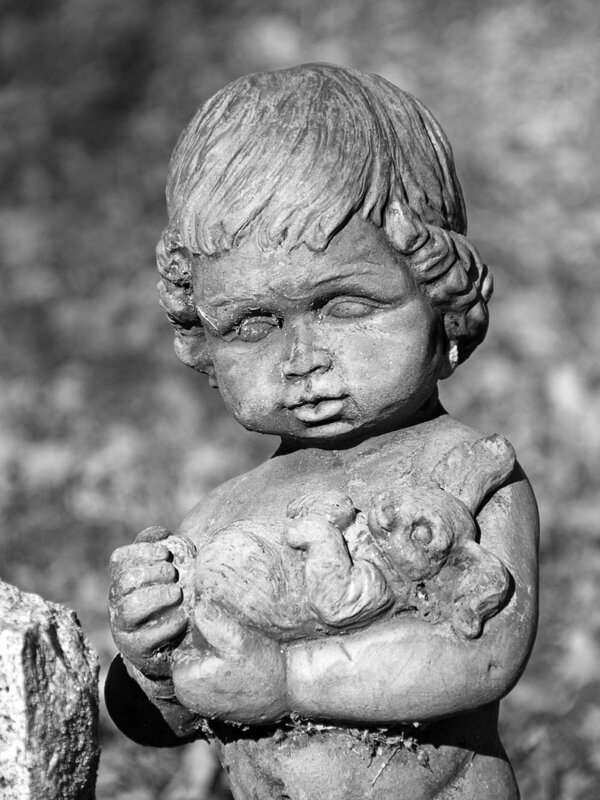 St. Patrick's Catholic Cemetery in Grass Valley. The Church dates back to the early 1850s, the cemetery to 1853. It is located at the corner of Church and Chapel streets. Shed not for her the bitter tear, nor give thy heart to vain regret, 'tis but the casket that lies here, the gem that filled it sparkles yet. St. Catherine’s Catholic Church watches over the town of Hornitos from a little knoll rising behind the old jail. Built in 1862, there isn’t another building quite like it in all the Gold Country. The church was built of wood along simple classic lines, and then made unique by the addition of stone buttresses on each side of the building, to help hold the walls in place. Perhaps the builders were fearful of strong winds, although more likely, they envisioned a long life for their church and wished to help it stand for the years to come. A walk through the cemetery behind St. Catherine’s will reveal the last, crumbling remains of one of the original hornitos, the above ground rock and adobe graves which gave the mining camp its name. On a nearby grave is an old wire cross which is said to be one of the town’s oldest remaining relics. The headstones in the cemetery relate just how world-wide an event the Gold Rush really was, as miners of many different nationalities made this old mining camp their final resting place. The Jamestown Cemetary was established in 1850 just south of town, at Woods Way on Highway 108. This is the public cemetery which has the remains of many early pioneers. Carved wooden headstones used to mark many of the burial sites. A walk through this quiet place, rolling hills, giant oaks. St. Joseph's Catholic Church (at left) is one of the first sights visitors to Mariposa will see as it is located on a little eminence overlooking the south end of Bullion St. Its elegant design and typical New England steeple make St. Joseph's one of the area's most familiar and photographed landmarks. 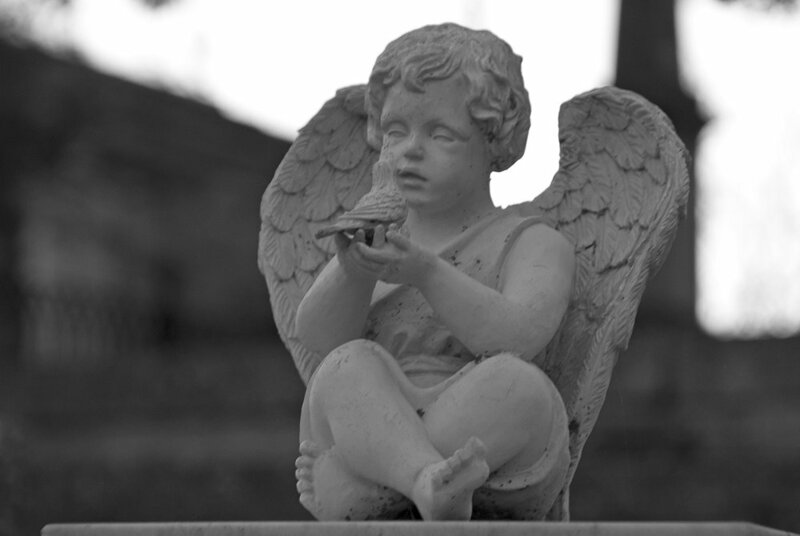 The Catholic Cemetery is located behind the church and a quiet walk through the tall grass, flowers and old headstones will reveal many well-known names of Mariposa County pioneers. At one time there was a pampflet available at the cemetery that mapped a path to some of the notable pioneer gravesites. Not sure if it's still available. The Pioneer Cemetery in Nevada City sits on a small hill near the top of Broad Street. It dates back to 1851. The monument above marks the final resting place of William Alphonse Sutter, son of the famous General Sutter of Sutters Mill fame. William left the family home near Sacramento to live a life of adventure, until illness overtook him and he came to Nevada City to live with his uncle, James J. Ott, the famous assayer. Unfortunately, the crisp mountain air failed to heal the young man and he died and was buried here in 1863, at the age of 31. Another of Nevada City's cemeteries, the Saint Canice Catholic Cemetery established in 1851, is located adjacent to the Pioneer Cemetery. The San Andreas Cemetery, also known as Peoples Cemetery or San Andreas Protestant Cemetery ,is located on a small hill on Cemetery Avenue. With residential areas on all sides, I often wonder how many kids have dared other kids to cut through the grounds on their way to a friend's house. The Sutter Creek Cemetery is located west of Hwy 49, on Mahoney Mill Road. It dates back to 1854 and holds many of Amador County's early-day pioneers and settlers. The Pioneer Cemetery in Coloma is also known as Coloma Protestant Cemetery, the Vineyard House Cemetery and Sutter's Mill Cemetery. It is the final resting place of many 49ers; farmers, merchants, miners, tradesmen, good men and bad men, good women and bad women. An estimated 400-500 graves are in this cemetery, many unmarked because the original wooden markers have long since disappeared. The oldest existing gravestone is dated 1850, although the first known internment is reported to have taken place in 1849. Ezra Schooley, of Ovid, Seneca County, New York died in Coloma on May 23, of 1850. This is possibly the oldest existing gravestone in the Pioneer Cemetery. It is located on Cold Springs Road, on the way to the Marshall Monument. 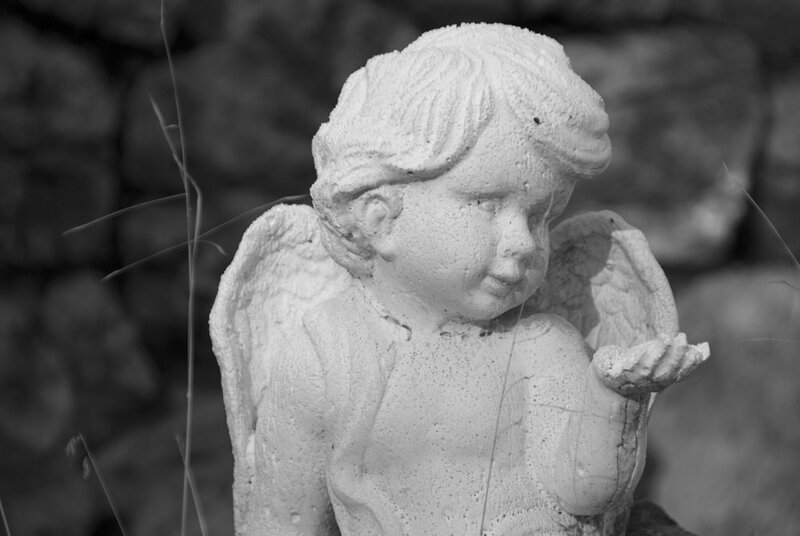 There is another interesting cemetery up near the Marshall Cabin, the Saint John's Catholic Cemetery located behind the church of that same name. These are just a few of the many Pioneer Cemeteries located throughout the California Gold Country. As I gather more information and more pictures, I'll create a "Part 2" post. I think I've reached the maximum number of photos that can be added to a post before it starts slowing way down.